Before I get into this week’s beer review, I have to disclose the fact that I bloody love NZ craft breweries, so I might be a little biased. Pretty good coverage for craft beer, me thinks! 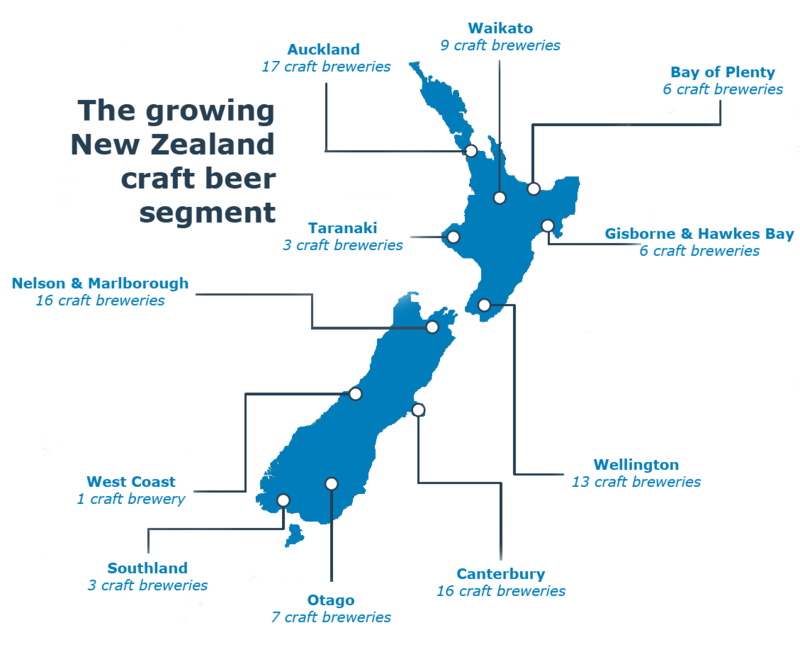 The New Zealand craft beer scene is so vibrant, some say it is running a little ahead of the Australian scene, but who cares who is in the lead with both countries showing solid growth year on year for craft beer sales and new breweries popping up every other month. I was reading this article the other day and it showed some good growth numbers for NZ in terms of the craft beer, and this one shows just as healthy number for the Australian scene…so let’s just agree that craft beer is booming on both sides of the Tasman! I remember visiting New Zealand in 2001 or so, before I had my eyes opened to the joys of craft beer, and I remember being really excited about drinking some New Zealand Beer. What do I remember drinking…Speights Gold Medal Ale and Heineken in cans…way to stretch myself! I mean, I have been to NZ a few times and have bungee jumped, white water rafted, landed on a glacier in a helicopter and ski tubed, and that was the best I could come up with when expanding my beer horizons? Excuse me while I go and take a long hard look in the mirror at myself. I’m back…thankfully I had woken up to myself when, a few years later, I went on a work trip with Big Brewer to Auckland for a training course. By this time I was a little wiser to the different styles of beers and went down to a few bars by the water and let my taste buds experience some great flavours. It was November 2011 and I was staying at the Sky City casino (slumming it!). I dragged myself to the reception desk on my final morning to check out, still a little tired form the night before for some reason? I was having a chat to this fella in the line, making small talk, asking if he enjoyed his stay, did he have a big one last night (nope a quiet night with a few of his mates), and what was he up to today. He seemed pretty interested as I told him about this cool craft beer bar I was at the night before and how I worked for an Australian brewer and was on a work trip. We were chatting for quite a while as two staff members were having to help out a third who was in training…I think she stuffed up some important customer’s bill? Finally we were both called to the desk and we said goodbye and wished each other well for our travels. I turned to the person next to me and said, “who is that guy on the cover…is he famous?” The guy laughed at me and said “yeah, you might call the All Blacks Captain famous around here”. I said, “ I was just chatting with him at my hotel” and the guy gave me a “sure you did” type of reply and walked off. I had been making small talk with the Captain of the NZ All Blacks, Richie McCaw, who only four weeks prior had raised the World Cup aloft after winning the final in his home country. I had absolutely no idea who he was, but upon reflection I thought there was some familiarity about him at the time but just couldn’t place him. I realised later that he looked familiar because at that time in my career I had been working on the Heineken brand, who were the sponsors of the 2011 World Cup. He looked familiar because I had seen pictures of him in a heap of promo videos and photos for the tournament! Again, after the fact of seeing his picture it kind of came clear to me that there were an unusual number of people milling around us at the time of our in-depth conversation about my hangover. They must have been thinking “piss of Aussie, we want to get an autograph from our World Cup winning sporting hero!” Full credit to Richie, for humouring this clueless, hung-over, Aussie who was probably distracting him from his thoughts of his media commitments for the coming day. 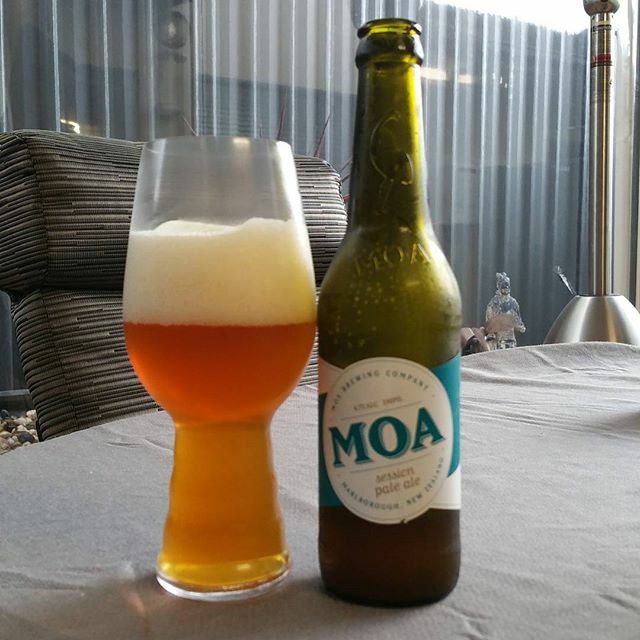 The beer, the Moa Session Pale Ale that reminded me of my times in New Zealand…what did I think of it? I would describe this as the perfect beer to drink in the sun after a long day trudging around after kids at a theme park…cos that’s how I had it, and I needed it after a big day at Movie World! It’s described as a new world Pale Ale, which I think is just brewer code for letting you know that if you aren’t into big and ballsy hop bomb Pale Ale’s, you can still pick this one up as a more gentle introduction to the style…but it also has a bit in it for those who do like the aforementioned beers. Typical fruity aromas on the nose from some great New Zealands hops (the hop bill includes Cascade, Nelson Sauvin, Motueka and relative new comer Kohatu) is a great start to this brew. This hop blend is backed by a nice pale malty backbone that provides the drinker with an easily quaff-able beer made with quality ingredients. After I finished my first, I wanted more, but that’s not unusual for me when I try these beers…I should buy more! 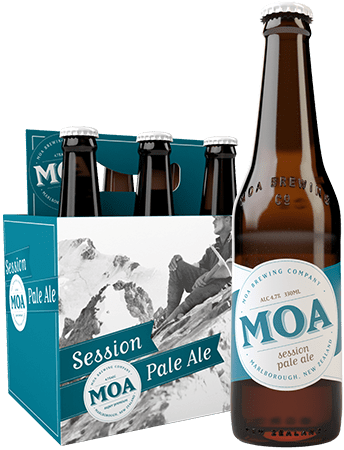 If you haven’t tried the Moa range of beers, I suggest you seek them out at your local bottle-o…there is something for everyone and you know you will be getting a quality beer. Rise Of The Brewing Machines – Craft Beer Lovers, Don’t Be Afraid!